Dean Faculty of Life Sciences, Professor of Zoology and former Registrar Prof. Dr. Muhammad Naeem Khan has been awarded the restigious Turkish "Mevlana (Rumi) Academic Exchange Program Award" for year 2017. According to the Council of Higher Education of Turkey, Mevlana (Rumi) Exchange Program is intended to help improve bilateral academic linkages and research collaborations between Turkish and Pakistani universities. 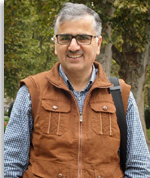 Under the academic staff mobility program, Prof. Naeem Khan will visit Kastamonu University in northern Turkey from October 1-15, 2017 to give a series of seminar and guest lectures, besides visiting historical academic and cultural institutions in Istanbul.